I love the content look on the face of the adorable cat in the picture above! That’s one comfy baby and I have a feeling he or she is seconds away from some very sweet sleep. 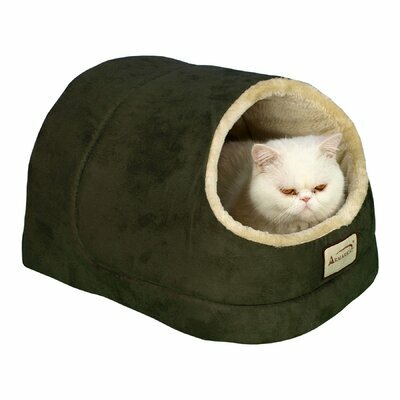 The extra comfy and handsome cat bed is the Laurel Green and Beige Cat Bed from Wayfair. Dimensions: 18″L x 14″W x 12″H. Click through the link or image for more information. You’ll also find a lot of other cat beds in equally great colors, shapes, and sizes.